Conservative approaches like these are designed to limit the progression of the bunion, relieve pain, and provide a healthy environment for the foot. In more serious cases, bunion surgery may be recommended. 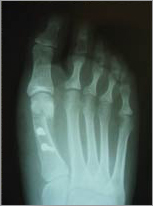 Many different types of procedures have been described for the treatment of Bunions. Over the course of time, Bunion surgery techniques have improved considerably. They are much more reproducible and can be performed with minimal post-op discomfort and a shorter recovery time. One of the keys that have lead to this change was the FDA’s approval of a new type of implantable screw. The “bold screw” is a headless screw that enables patients to return to both shoes and activities of daily living much sooner than with the first generation of screws. Because the screw head is missing, the screws can be placed beneath the surface of the bone, avoiding the need for retrieval, and can be placed on an angle allowing better fixation on the bone. This new technology is one that was invented by one of the world’s most prominent foot surgeons. 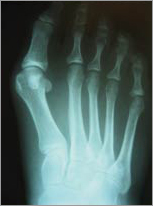 The procedure involves a “Z” cut through the bone, allowing the bone to be repositioned in a way to narrow the foot. The titanium “bold screws” are placed across the osteomy (cut), enabling the bone to be rigidly held in the new corrected position. The high torque exerted by the screw enables the bone to heal from the inside out, eliminating the need for casts and crutches. Restricted ambulation is advised for the first 48 hours following surgery. Walking is permitted with the use of a flat surgical shoe. Depending on age and health, the surgical shoe can be discarded at 2-3 weeks and soft running shoes can be worn for 3 weeks. Sutures remain in place for about 2 weeks, at which time normal bathing can be resumed. The return to stylish shoes and sports can vary from patient to patient, but usually takes about 10 weeks following the surgery. The procedure is generally performed under light sedation without an overnight stay. The success rate combining this new technology with the Z Bunionectomy is between 90% and 95%. In most instances, people are back walking a mile within 6 weeks from the date of surgery. The costs of this procedure are covered by insurance.